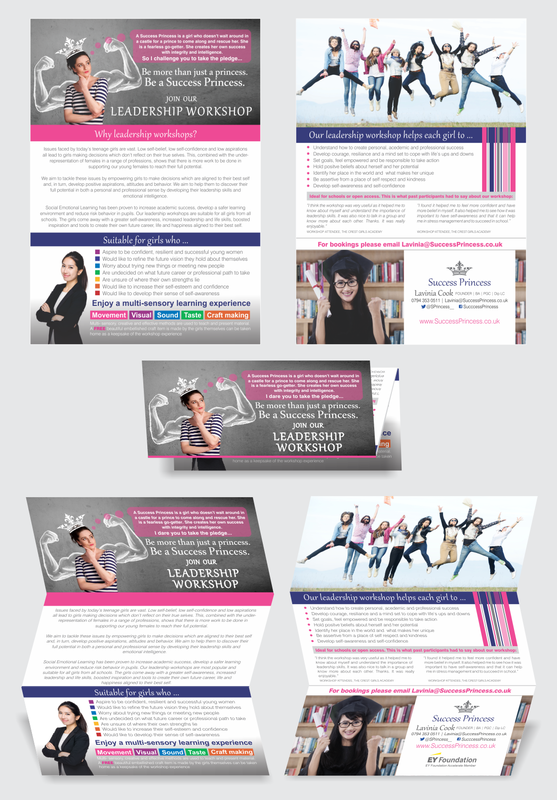 Today we're sharing a dual-purpose double-sided pamphlet completed for Success Princess last week (we designed their logo in December last year). The owner, Lavinia, required the pamphlet to appeal to teenage girls as well as sponsoring companies, and to give enough information to create an interest but not to look too wordy. The pamphlet had to double up as both a compact printed document and an electronic file for emailing. As design comprises problem solving to a large degree, we solved these issues by designing a 3-fold pamphlet that also works as a flat pamphlet. In order to create the illusion of less text (even though there is quite a bit), we used large image panels, bullet-point sections and text blocks throughout the design. We think it works and the client loves it.